It was the last day of July and I was scanning the components of August's block for my Home on the Range BOM when I happened to notice that the block I was making was not in the public domain. Ee-yi-yi, how did that happen?! I thought I had weeded out all of the blocks that were credited to someone who might still have a valid copyright. This particular block was Judy Martin's Puppy Dog Tails. I remember seeing Judy Martin on a TV quilting show in the last dozen or so years so I know she has a valid copyright to that block. I have no desire to infringe on someone else's copyright, so at the eleventh hour I had to come up with a new block. I looked at the blocks I had passed on for this BOM and didn't like any of them. Some were too complicated, some were too much like others I've already chosen, and some just don't appeal to me. I stared at my pile of pieces already cut out with most of the components (like HSTs) already sewn and groaned at the thought of having to start completely from scratch. Then the light bulb went on! Maybe I could rearrange the components into a new design that wasn't copyrighted. After an hour of playing with Electric Quilt software, I had six designs at my disposal. Next came the hard part: researching to see if they already existed. I think of these blocks as 7-patch designs because they're based on a 7 x 7 grid of equal squares. 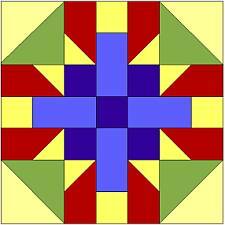 But Barbara Brackman, in her Encyclopedia of Pieced Quilt Patterns, classifies them as "unequal 9-patch" blocks. 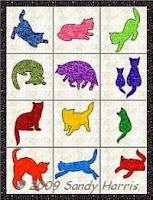 And Maggie Malone, in 5,500 Quilt Block Designs, has them grouped with the "5-patch designs." I've seen lesser known books use different classifications yet. The sixth design that I created was my favorite, so I did my best to locate it in the first two major reference books. An hour later, I breathed a sigh of relief because I didn't find it in either book. Of course, I could have missed it. And quilters are designing new blocks all the time and these two books by no means contain every pieced block ever designed. But there's absolutely no way I can research every quilt block ever designed. I've done my best for now. I've named my block design "Cowboy Star" and will claim copyright unless I learn otherwise. I sewed up my reorganized pieces into my new block today and will have all of the photos and instructions on my website tomorrow. And I've got my fingers crossed that no one notifies me that they saw this block in such-and-such book. And if they do, please let it be in the public domain!